My contribution only edits the checkout_confirmation.php page but doesn’t change the checkout process at all. It simply takes the user to conditions.php so he/she can read it or redirects him/her back to the homepage. This entry was posted in osCommerce and tagged agree to terms, confirm, osCommerce on June 9, 2008 by a8le. My primary challenge was I couldn’t figure out, “how to generate the encryption keys on my shared hosting Linux server”… necessary for OpenSSL to work. I eventually learned that the keys are not generated from the servers, you only upload the keys to the server. Just as you would with standard html files. As you can see the module calls for: 2 keys generated by you, and the only way I was able to generate “both” keys was by following a post by Martin Hughes-Jones, click here. For the remainder of the field items asked by the module I followed a Lunarpages post, click here. Your file paths will not match mine. The keys should be in a password protected folder, e.g. I put mine in a folder called openssl in my admin folder. Don’t forget to create the “working directory” folder… or you will get an error as I did. 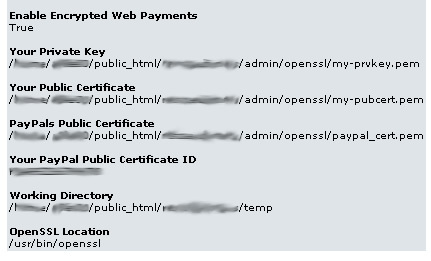 Well, that’s it, your osCommerce “PayPal Website Payments Standard” web payments are now encrypted. This entry was posted in osCommerce and tagged OpenSSL, osCommerce on June 9, 2008 by a8le. While setting up an osCommerce installation, I decided that I needed “regular, plain, standard, whatever you want to call them” buttons for it’s frontend. I searched the osCommerce contributions/addons site and found nothing “standard”. So, I opened up my image editor of choice (Fireworks), then did a little magic and ended up with a contribution, here. This entry was posted in Design, osCommerce and tagged buttons, images, osCommerce, standard on May 3, 2008 by a8le.